Google reported profit and sales that topped estimates, lifted by robust sales of online ads and tighter cost controls, putting parent Alphabet Inc. on track to overtake Apple Inc. as the world’s most valuable company. The results, reported for the first time under a new structure that separates Google’s main search and advertising operations from riskier investments, show that fourth-quarter revenue, excluding sales passed on to partners, rose 19 percent to $17.3 billion. That exceeded analysts’ average projection for $16.9 billion, according to data compiled by Bloomberg. Profit, before certain items, was $8.67 a share, beating the prediction for $8.08. Google, which has been investing in artificial intelligence, self-driving cars and health technology, changed its name and structure last year to give investors a clearer view into the performance of its Web business and the money Alphabet Chief Executive Officer Larry Page is devoting to new projects. 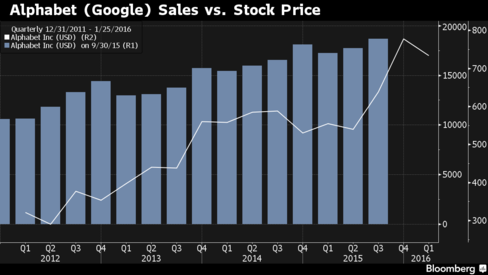 The health of Google’s main business and investor confidence in the company’s ability to innovate has helped to more than double the stock price in the past three years. 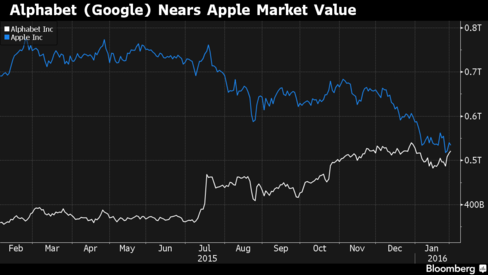 The shares of Mountain View, California-based Alphabet rose as much as 9.4 percent in extended trading. The stock advanced 1.2 percent to $770.77 at the close in New York, giving it a market capitalization of $523.1 billion, compared with $534.7 billion for Apple. The new structure is designed to accelerate Google’s forays into other businesses beyond ad sales, by giving the newer divisions more flexibility. The shift to Alphabet has also given more freedom to top executives who would otherwise want to run their own companies. Investors also learned how expensive the company’s futuristic ambitions are. Alphabet’s “Other Bets” category had an operating loss of $3.57 billion for the year, widening from $1.94 billion in 2014, while revenue from these units rose 37 percent to $448 million in 2015. The new structure has also given more to autonomy to Google’s main business under CEO Sundar Pichai. He has devoted resources to buffing up Google’s ad products, introducing new formats while improving the delivery and accuracy of targeted marketing spots. A key challenge is to control spending on initiatives to boost traffic, which are aimed at making up for declining ad prices on mobile devices. Total clicks on ads were up 31 percent in the latest period, even as the average price for an ads on Google’s websites fell 16 percent. While operating expenses rose 14 percent during the fourth quarter to $7.76 billion, they slipped as a percentage of revenue to 36 percent, from 37 percent a year earlier. In another sign of the fiscal discipline brought to Alphabet by Chief Financial Officer Ruth Porat, capital expenditures shrank to $2.1 billion for the quarter, from $3.55 billion a year earlier. Fourth-quarter net income rose to $4.92 billion from $4.68 billion a year earlier. “It’s the new management story, with a focus on cost discipline and capital spending discipline,” Olson said. Alphabet’s other bets span everything from robotics and Internet-beaming balloons to self-driving cars and health-care research. While they are mainly costs that are supported by Google’s search-ad operations, they have the potential for long-term growth, according to Ivan Feinseth, chief investment officer of Tigress Financial Partners LLC, who has a buy rating on the stock. Thanks a sound wonderful story that's knocked our mind because Your workload is lessened when done with the help of Mac Book.